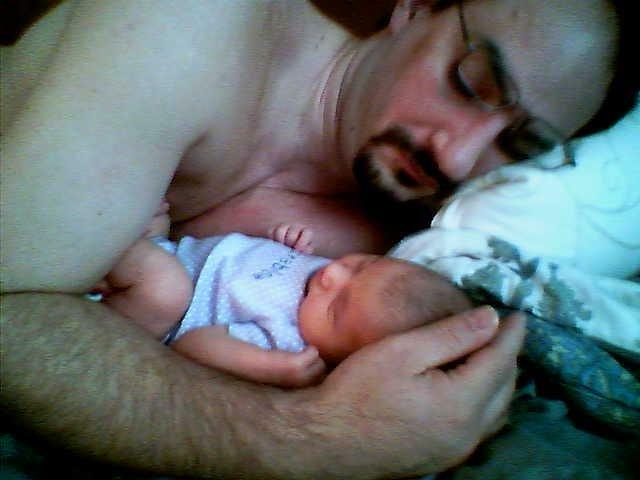 Sorry pic is blurry, my cellphone was what was handy at the opportunity of the little squidge sleeping with her brand new Daddy, so small and frail. Now, so many changes later: many developmental stages, many sleepless nights, weigh-ins, vaccinations, teethings, fumbles, new words come and gone while she tries to navigate the physical world and speaks to us in burbled sentences and very clear gestures. We have the pleasure to know this wonderfully funny, perceptive, never blinking, unflinching, deliberate and beautiful girl. A gift at a late life stage, amazed we were even able to have her. She is our joy daily, big and strong, and easy-going. And if it weren’t for her, I wouldn’t have connected so strongly with the women involved in this community, wouldn’t have B&M’ed about sleepless nights, naps while nursing, frustratedly typing at my manuscript while she kicks the keyboard. I’ve kvetched so and welcomed much needed commiseration in the past year here. Thanks, fellow moms, no joke. May your ideas turn into beautiful completed creations, get published, galleried and sold and your children grow well. Best birthday wishes to little C! Many happy returns of the day!!! Those short folks around the house change our lives in SO many ways, don’t they? Expected and surprising ways. Mine have also led me to wonderful friendships with wonderful women — like those here. One of the many blessings of motherhood! your week sounds like fun and relaxing! thanks, i just wish it were taken with a better camera…. Happy Birthday, Baby C!!! Both pictures are just adorable…what a difference a year can make, huh? They grow up way, way too fast. Is it my imagination or have our babies suddenly matured seemingly overnight? 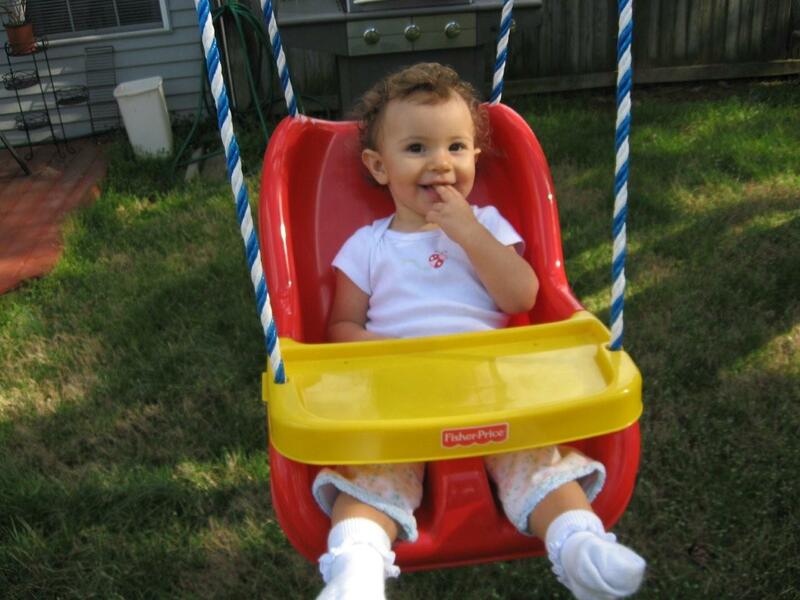 I saw a pic of baby C on facebook last week and she did not look that big! I’m feeling the same shock when I look at her that I feel when I see John. Where have our babies gone? Happy 1st birthday, baby C! thanks, kristine! i am astounded by the difference. i turned to dh the other night and snuffled about it. thanks, brittany – i know exactly what you mean..it was overnight wasn’t it?! or maybe that’s just the accumulated amount of sleep i’ve had since she was born – one full night. ;P your blog the other day with the curly red head in a swing stunned me, too. to think you were so worried about his muscle tone, etc when he was itty bitty! now look how big and strong he is! happy birthday little baby c! i like the blurry quality of the first photo. it’s dreamlike and very precious, like a memory. and she looks like so cute in the second one. seriously, thanks for the perspective, wishes and compliment! I concur — I thought the newborn image was intentionally soft-focus when I first saw it. You should have taken credit for your creative brillance rather than apologize for camera phone! 😀 okay, okay! and the weird color tones were on purpose, too! thanks, miranda, i needed a laugh. ah, thanks, liz, she’s pretty darn close to perfect. just wish she’d sleep her good chunk after 11pm, intead of before!